It looks like Harrison’s Pub and Yotes Pizzaria are no longer. A new business is taking over that location. The Omaha Pizza Review Crew is at it again. 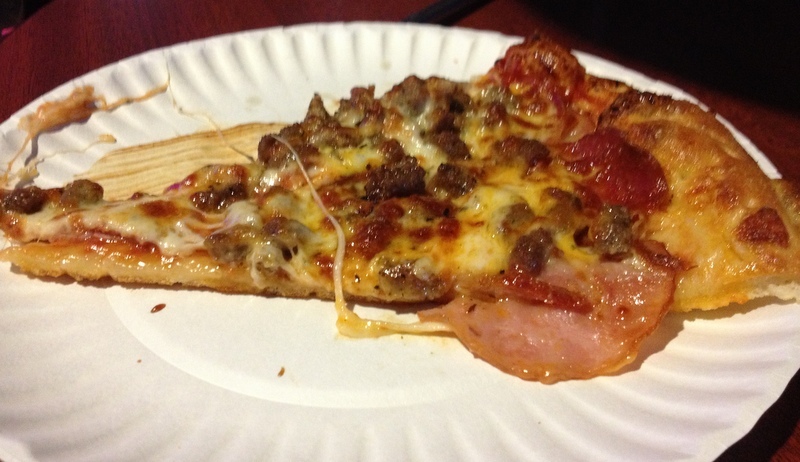 This time our pizza of choice is a new comer to the West Omaha area: Yotes BBQ Pizzaria located inside Harrison’s Pub (the former Rum Runner) on the Southwest corner of 180th and Harrison. Yotes, formerly of Springfield, Nebraska, operates a small dine-in and carry-out business inside the pub. They have just two tables on the restaurant side, but you can also order from, and eat in, the much larger pub side, which is exactly what we did this past Friday night. Soon after ordering our apps were delivered. 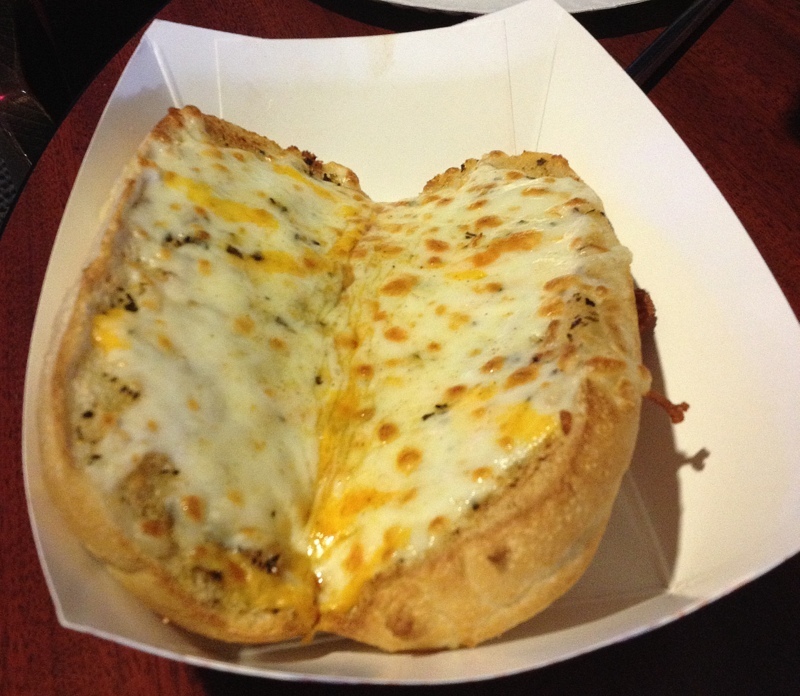 The cheezy garlic bread was most certainly cheesy and garlicky. It had slightly more garlic than The Pizza Wife would have liked, and she wouldn’t have minded if it were a bit crispier on the bottom, but that didn’t stop her from polishing nearly the entire order on her own. The smoked chicken wings were exceptional. Great smokey flavor and juicy. Unfortunately, they were the best part of the meal as both of our pizzas were somewhat of a disappointment. We’ll start with something that both pizza suffered from: a limp, doughy and underdone crust. Yotes clearly uses a conveyor oven to cook their pizzas, which in and of itself isn’t the problem. If the conveyor oven is profiled correctly for your specific pizza, it can produce some really good pies. Unfortunately I don’t think they’ve had their oven calibrated correctly (or at all), unless of course their goal is a soggy crust, but I doubt that. Our first piece of advice to Yotes would be to get on the phone right now to your oven rep and have them properly adjust your oven. You’ve got to have a good base for your pies, or you’ll soon have no one to serve them to! Our chicken Thai pizza wasn’t bad in my eyes, and I liked it a little more than The Pizza Wife did. The chicken on the pie was really tender, juicy and tasty. A+. It also had quite a bit of heat to it, which I loved, but that’s where we lost The Wife’s vote. She felt the chili sauce overpowered the other flavors of the pie, and the sauce (straight up sweet chili sauce, nothing tomato based) and the cheese made for a ridiculously greasy pizza. Grease + limp crust = a disappointed Pizza Wife. 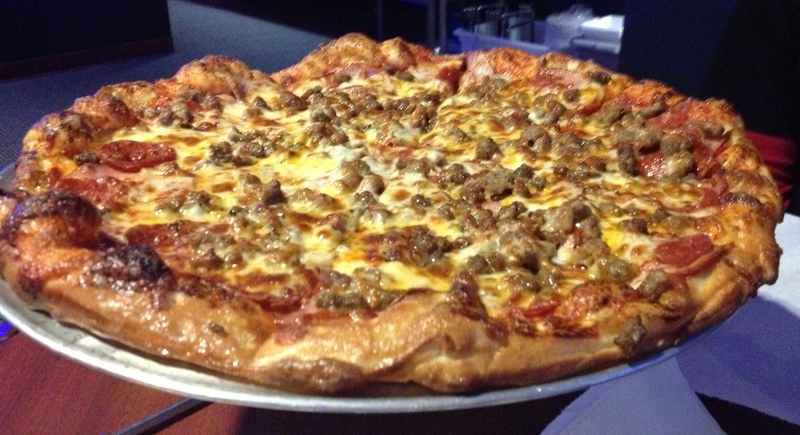 The Cowboy pizza contained the kind of toppings a carnivore like me really enjoys. Meat. No weeds. If we take the crust out of the equation, the pizza tasted pretty good. The sauce was thin but good, and the pie had plenty of cheese and toppings. Unfortunately, just like the Thai pizza, it was greasy. Overall we come away from our visit to Yotes disappointed. 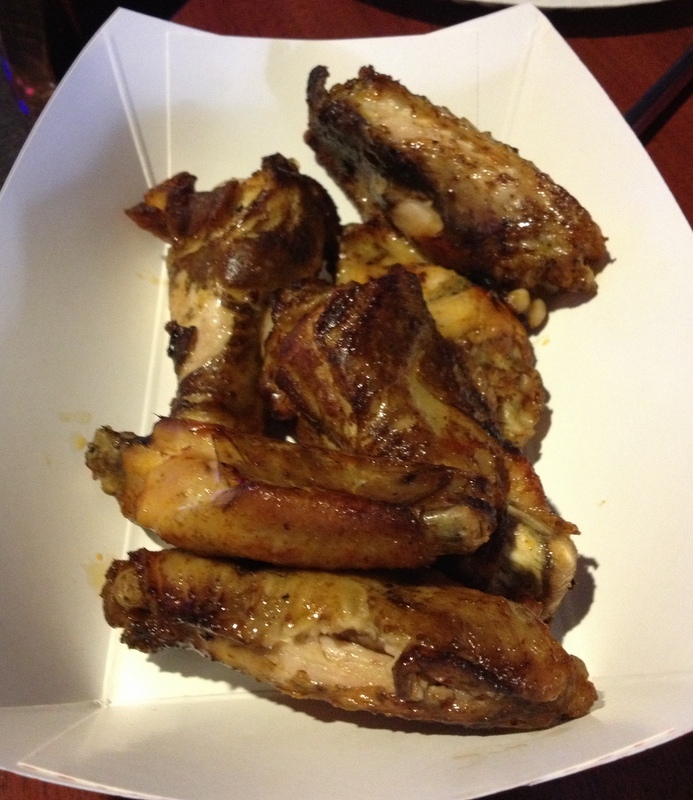 The best parts of the night were the bucket of cold beer and the awesome smoked chicken wings. We’ll certainly make a return visit to try out their BBQ, but we’d recommend skipping them if you’re craving pizza. Oven: Conveyor – and a poorly profiled one at that. 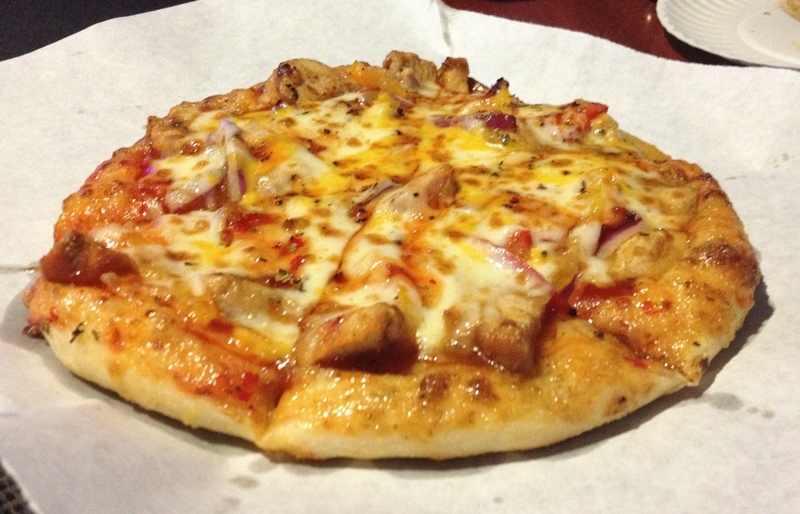 How would you rate Yotes BBQ Pizzaria? Click on the stars below! This entry was posted in Pizza and tagged Yotes BBQ Pizzaria. Bookmark the permalink.